Do not go near baby alligators in the wild. Mothers will stay with their young for up to two years, so a mother alligator could be nearby and think you are threatening her young. In this case, she will attack you. Keep pets and any other kinds of food away from your hatchling and young gator. Alligators are not overly particular about what they eat and will eat whatever is handy. Do not put small pebbles in your hatchling enclosure; use only larger natural rocks that have been sterilized by boiling. Your baby alligator will probably eat some and they could get lodged in her digestive system, which could result in illness or death. Feeding a baby alligator in the wild is not recommended. 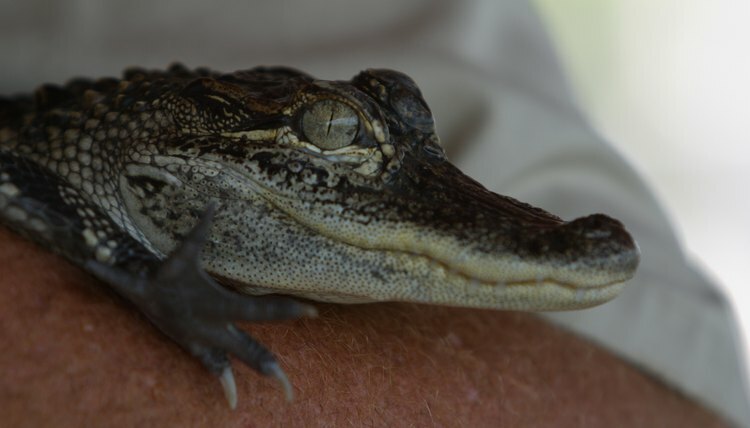 Caring for baby alligators, or hatchlings, requires special knowledge, and you must carefully consider what will happen to your pet once it reaches an unmanageable size. Because alligators grow about a foot a year until they reach maturity, it will not be long until you have a pet that is able to do significant damage to you, your family and your home. It is illegal to keep alligators as pets in many states, and many of those where it is legal require you to have the proper permits or licenses. You can successfully feed your pet baby alligator by using common sense and following a few important guidelines. Choose foods such as small fish, insects, crawfish, small mice and frogs. Alligators eat whole food in the wild, so do not feed your hatchling a steady diet of meat pieces. They need the calcium and other nutrients found in whole food. Use unfrozen, raw and preferably live food to feed your hatchling or young gator. They have sensitive digestive systems and cannot handle cooked or frozen foods. Thaw any frozen or partially frozen food first before feeding it to the hatchling. Feed your hatchling every other day; juveniles every three or four days. Alligators will eat as much and as often as you let them, so keep to a strict schedule. Overfeeding will lead to gout. Use a utensil to feed your hatchling so that both you and the baby get used to not associating your hands with food. This will help prevent confusion, which could be deadly later on. Set up a feeding routine and schedule. Feed your hatchling at the same time of day, using the same method and in the same location. While you cannot “train” an alligator, you can keep him calm by keeping things predictable.